marked exactly 500 years since a Great Court of Devon tinners was held on Crockerntor near Two Bridges in the heart of Dartmoor in 1510. Richard Strode MP was imprisoned by the tinners in Lydford gaol for trying to curb their activities by introducing a Bill into the Westminster Parliament. After his release, and because of his treatment, Strode introduced a new Bill at Westminster which, it is argued, became the foundation of parliamentary privilege. The exciting discovery of a previously unknown record of a Great Court of Devon tinners held in 1710 was also marked as a 300th anniversary on the same day in 2010. Besides being of considerable intrinsic interest, this unique and important record includes the only known eyewitness account of a meeting on Crockerntor itself. The original record is reproduced in full. 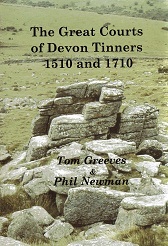 The book also explores the context of these two remarkable events, based on much original research about tinners and tinworking in Devon in the early 16th and 18th centuries. The book has colour and black-and-white illustrations, a full bibliography and a comprehensive index.